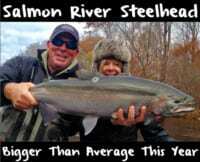 We struggled in November to catch steelhead on New York’s Salmon River, but things have turned the corner in recent weeks. After a frustrating November fishing is much better now. Keep in mind, our salmon were late and I think our steelhead were just late, too. I don’t think it’s a banner year for steelhead, but it’s way better than it was six weeks ago. There’s plenty of fish to catch now. Early in the season small fish plagued us. However, in the last month the larger fish have migrated in and we have more opportunity to catch adult steelhead now. I don’t think there’s a ton of fish around, but recently it’s been getting better and better. Numbers are increasing daily. I think the late run is a reflection of us having the warmest summer in 40 years. Maybe the lake was just too warm and they are finally coming now that the water has cooled down. We did have a lot of high water in late November and into December and some fish came in on that. In fact, we had super high water the first, second and third of December, which triggered a lot of fish to come in. For those who weren’t around in late fall conditions changed on us in a hurry. From November 28 to December 5th we had tough fishing. What happened was we had a heavy snow and then it got warm and everything melted. Even though the air temperatures was normal the water was all snowmelt and the water temperature fell into the low 30s almost overnight, which hurt our bite. Fortunately, as conditions stabilized the fish turned back on, which is where we are now. We are now sitting in our winter pattern. Now that we are in the winter pattern bait and beads are the mainstay, which means we downsize our eggs sacks. We’ll use nickel to dime size now, whereas we were using a quarter-size in November. To be honest, I think brown trout eggs will out fish salmon eggs this time of year. There’s a different smell. 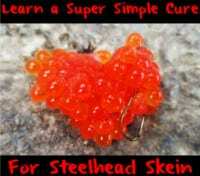 I cure my brown trout eggs in Natural BorX O Fire. We have good water conditions now, but as the water drops I’ll use five-pound Maxima fluorocarbon for my leader and maintain my six or eight pound mainline. When fishing egg sacks white has been good this year, although yellow and pink are good, too, and I’m referring to yellow not chartreuse. I’ll fish the eggs sacks on a Mustad 37132 size 10 or 12 hook. Steelhead are dropping into the winter spots. They are moving out of the faster water and into their winter holding areas, which would be the bellies of the pools. The water is still up and we are seeing a lot of silver fish in the lower end of the river, which tells me we will have fresh fish through the end of the year. Editor’s Note: Troy Creasy is the editor of Lake Ontario Outdoors and operates High Adventure Sport Fishing. 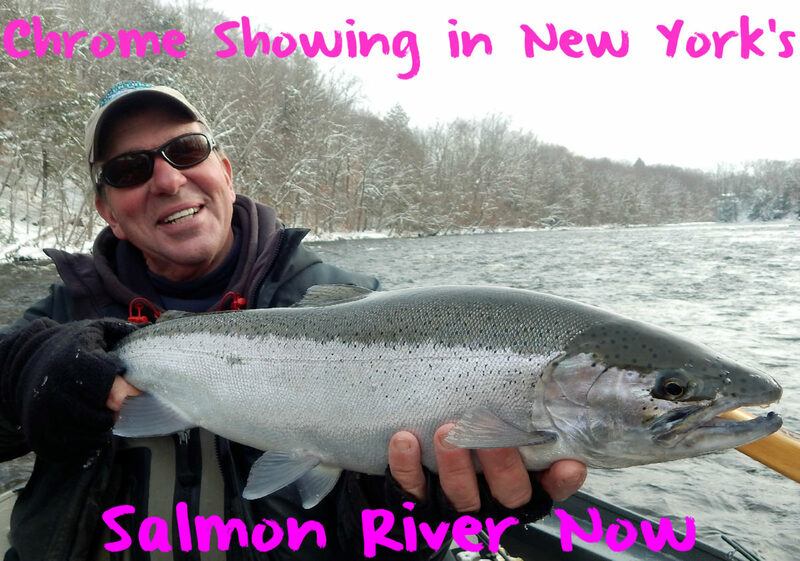 For more information on his Salmon River late winter and early spring drift boat steelhead trips please visit http://www.highadventurefishing.com or https://www.facebook.com/troycreasy62.